A view inside a warehouse in the Vientiane Special Economic Zone where cast-off electronics await recycling, April 4, 2014. An industrial plant that mines cast-off electronics for their valuable metals appears to be pumping polluted waste water into the neighborhood surrounding Vientiane’s Special Economic Zone causing contamination levels to jump dramatically, local residents told RFA’s Lao Service. The Hokeng Metal Processing Co. plant located in Nonthong village in Vientiane’s Saythany district reclaims copper, lead and other valuable minerals from computers, televisions, batteries and other castoff electronics, and then resells the metals to customers worldwide. In addition to the fear of water contamination, residents near the plant say the smell is horrible. Hokeng Metal Processing is a subsidiary of Sunrise Metal International, according to Sunrise Metal’s website. While Sunrise is headquartered in New Zealand, it is a part owner of Hokeng, which has operated for five years since winning approval by the government. While company executives could not be reached, an official working closely with the company who also spoke on condition of anonymity, said the villagers have need for concern. He told RFA that a recent inspection turned up contamination at more than 16 times the normal level. While Ministry of Natural Resources and Environment officials told RFA they are working on pollution management at the plant, the ministry has yet to take any action against the company for dumping the waste water. However, the company was found guilty of importing raw materials from Hong Kong, and now those materials are being kept in the Vientiane Thanalaeng warehouse until authorities can dispose of the case. According to the Ministry of Finance, the officials quarantined 58 containers of raw materials imported by the company in the government warehouse because they suspect Hokeng failed to comply with the international treaty known as the Basel Convention that attempts to regulate the transfer of hazardous waste from developed to less developed countries. 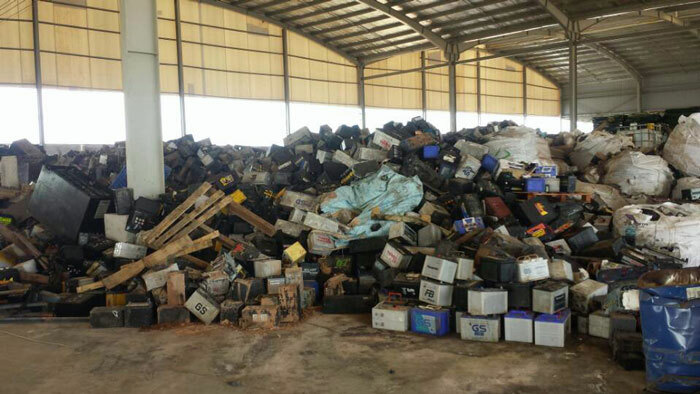 Lao authorities accused the company of failing to identify the kinds of raw materials contained in the containers; avoiding customs inspections; failing to inform officials of the types of waste; and it may have imported a type of waste that is unacceptable in Laos. While it’s unclear what action, if any, Vientiane will take, the government is aware of the problem, according to a government official who spoke on condition of anonymity. Reported and translated by Ounkeo Souksavanh for RFA's Lao Service. Written in English by Brooks Boliek. All of these corrupt officials will be paid off and no action will be taken.